So excited to introduce ya’ll to a very special person who has made all the difference in my life the past couple months, and that is my intern, Shawn. Shawn is a powerhouse (watch out, world!) – she’s super smart, determined, and has such a big heart. I’m so excited to see where we she goes after her RD – big things await this girl! Fate brought us together last fall at a food conference in Boston and in the most adorable way possible, she said to me “oh my gosh, I hope I don’t sound crazy right now, but I know you! You’re Kara, right? I follow your blog!” It was nutrition love at first sight. 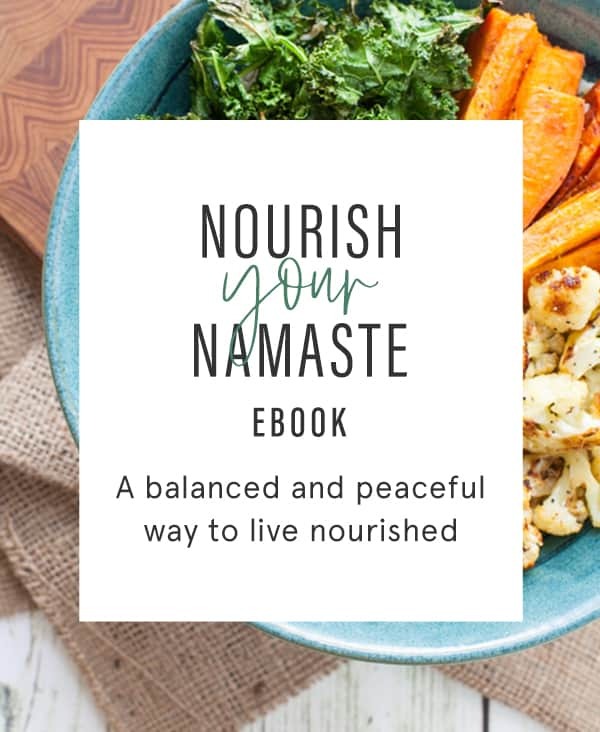 I’m so proud of all Shawn’s hard work and thrilled she’s sharing her DELICIOUS recipe and BEAUTIFUL photography with you today. 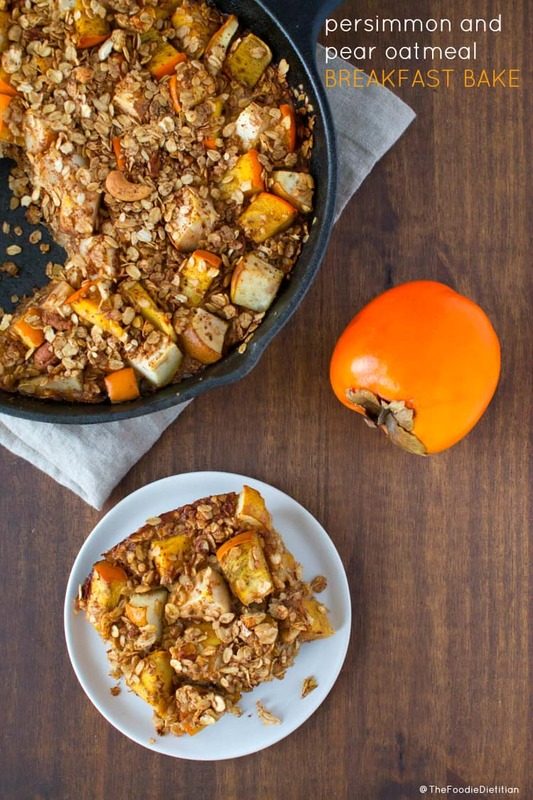 This persimmon and pear oatmeal breakfast bake is so delicious you might mistake it for dessert but it’s healthy enough to be dubbed the best warm breakfast for a cold morning. 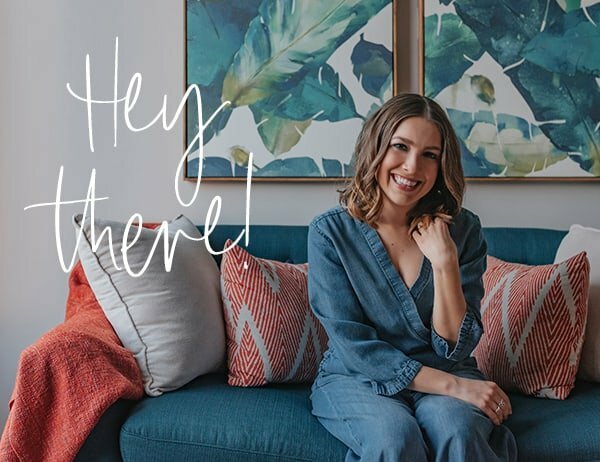 I just want to start by thanking Kara for first, taking me on as her intern, and second, for letting me share a recipe to her dietitian and foodie blogging world. It’s been a blessing being able to work alongside Kara and learn all about social media and blogging, as I am still getting my feet wet with it. Before the holidays, Kara had asked me if I’d be interested in developing a recipe. Immediately I knew that I wanted my recipe to include persimmons. I bought my first persimmon sometime in the fall, and thought, how the heck am I going to eat this thing? After asking some RDs on the interweb about what to do with them, I went out on a whim, sliced the little beauty and enjoyed it in its purest form. I was smitten. You can find persimmons during October-February. This fruit really is the perfect little package full of nutrients such as Vitamins A, C, E, K, potassium, copper, and my favorite, fiber. Even better, they look like a tomato but taste like a less-sweet apple, so you pretty much feel like you are eating a vegetable and fruit at the same time. Win. Two of the most common varieties sold in the US are Fuyu and Hachiya. 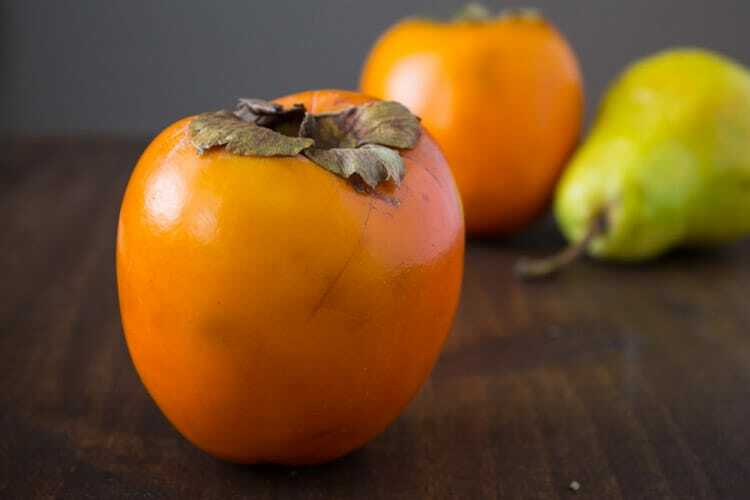 Fuyu persimmons have a smaller and plump shape, are sweeter, and are good for eating raw, such as in salads (or by themselves). 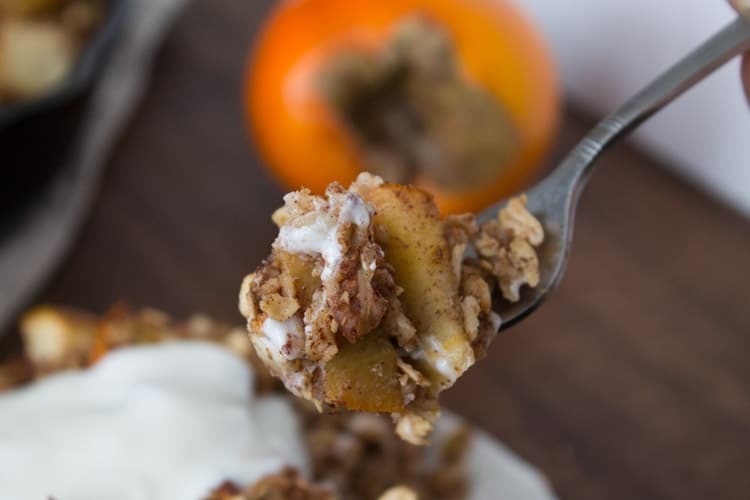 Hachiya persimmons look like an enlarged acorn, are slightly more bitter, and are great for baking, as they soften in the process to produce their sweet flavor, which makes them so great for this oatmeal breakfast bake I have for you! I included another one of my favorite cold-weather fruits into the mix: pears. These two fruits create the perfect balance of sweetness, meaning there is little sugar had to be added. Combined with nuts and oats, this oatmeal bake will give you a satisfying and filling breakfast (or even a late night snack). Seriously, it will make you want to sing persimmon praises because it’s that delicious (at least I did, anyways). The best part of this oatmeal bake? You can adapt it for any season, so use the oat and milk mixtures as your base, and change up the fruit however you desire! Mix oats, cinnamon, nutmeg, baking powder and nuts in a medium mixing bowl. Add 2 tbsp melted coconut to combine oat mixture. Beat egg with almond milk, agave nectar and vanilla in a small mixing bowl. In a cast iron skillet, use 1/2 tbsp coconut oil to lightly grease the bottom and sides of the skillet. Layer 1/3 of the oat mixture on the bottom of the skillet, followed by half of the persimmon and pear. Repeat this step and then sprinkle the last 1/3 of the oat mixture over the top of the fruit. Pour the milk mixture over the entire mixture, and give the pan a little shake to distribute evenly. Bake in the oven for 35-45 minutes or until the oat mixture is golden brown and fruit is fork-tender. Shawn is currently at Boston University in the combined Master’s of Nutrition and Dietetic Internship program. 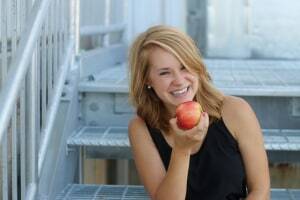 She hails from Lincoln, Nebraska, where she received her Bachelor’s of Science in Dietetics and Exercise Science. When she is not studying, she enjoys running, spinning, yoga, trying new recipes, dabbling in social media, exploring the city, and dining at local restaurants. Ahh love seeing another girl out there that’s a dietetic intern, I’m completing my masters in sports nutrition/dietetic internship right now! Trying to currently set up all my rotations 🙂 So fun you found Kara and intern under her. Good for you, Sarah Grace! Best of luck setting up all your rotations!! 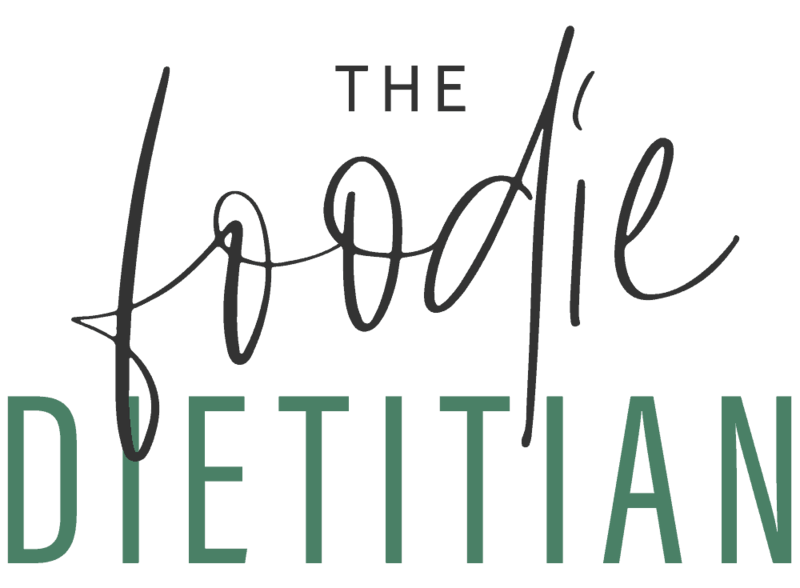 Shawn, welcome to The Foodie Dietitian! And what a fabulous recipe to start off! 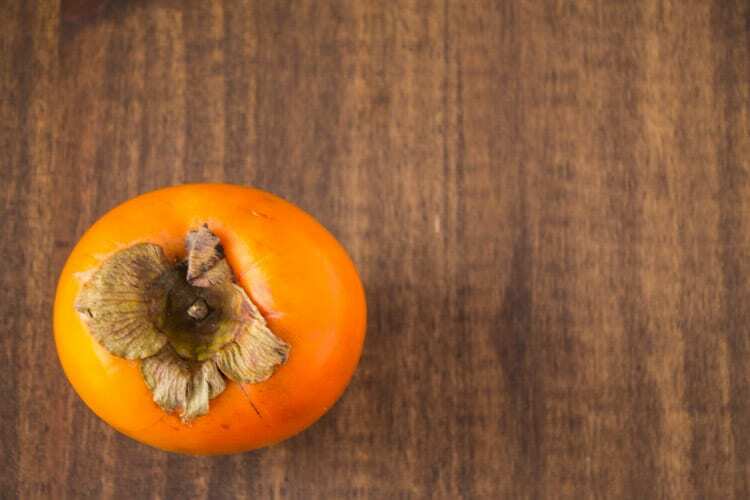 I’ve never actually had a persimmon – been a little afraid to try them! 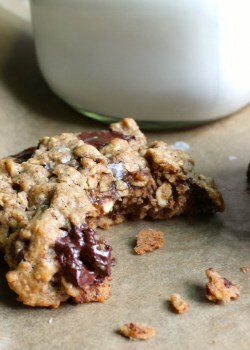 But this looks delish and I love me any oatmeal bakes, so I will have to try! Baked persimmon is the best! Hope you’ll give it a whirl soon! Me too, Anna!! I hope the motivation was worth it this morning 🙂 Thanks so much! I love when a healthy breakfast is yummy enough to pass as dessert 🙂 Looks amazing! Love adding fruit to naturally sweeten things up, especially oats! It has been way too long since I had a persimmon and this makes me crave one. I could definitely enjoy some of this all day long! Thanks, Alanna! Totally – this is one of those recipes that I could eat for breakfast AND dessert! 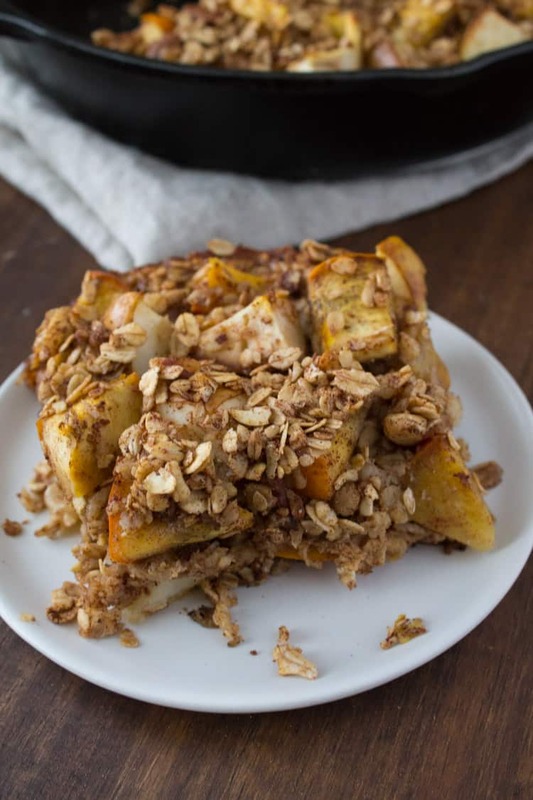 Love baked oatmeal, definitely going to have to try this fruit combo for my next batch. Good to meet you Shawn – persimmons are one of my favs – I adore your use of them in this recipe combined with those spices and pears and oats! 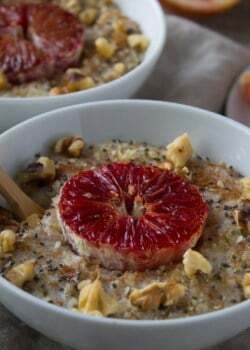 O how I do love persimmon and baked oatmeals! I recently discovered persimmons too! 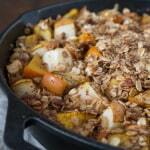 Baked oatmeal has always been a favorite of mine so I can’t wait to try this! Woot! Woot! Welcome to the persimmon partay! What a fun story Kara! Thanks for introducing us to Shawn and her delicious persimmon breakfast bake. I’ve never cooked with them before, but you can be sure that I will now. Yum! Thanks, Linda! The Hachiya versions are great for baking!